High on confidence after a 35-33 win over the Bengal Warriors in their last assignment, the Haryana Steelers will look up to Monu Goyat to produce more magic as they square off against the UP Yoddha at the Thyagaraj Sports Complex in Delhi. While the Steelers have finally collected an important win, the UP Yoddha have certainly only themselves to blame for the lacklustre performance this season that has seen them lose their last five matches by at least nine points or more. 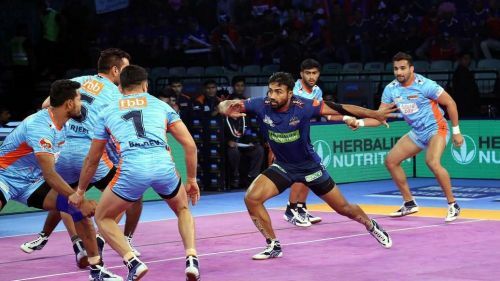 With the raiders failing to fire and the team hit by a spate of injuries, the Yoddha languish at the bottom of the Zone 'B' table with just three wins from 16 matches. On the other hand, the Steelers have blown hot and cold this season to clinch six wins from 17 matches. However, the Steelers will be buoyed by the form exhibited by Monu Goyat, who seems to have warded off his poor form with two back-to-back 'Super 10s' from his last two games. With Rishank Devadiga failing to live up to his role as the captain, the Yoddha certainly need to pull up their socks in order to prove stiff competition to the Steelers and one man who can turn the tide in their favour is Shrikant Jadhav, who's pacy raiding could be the 'X' factor. Haryana Steelers: Monu Goyat (C), Vikas Kandola, Naveen Kumar, Sachin Shingade, Kuldeep, Sunil, Parveen. UP Yoddha: Rishank Devadiga (C), Shrikant Jadhav, Bhanu Pratap Tomar, Nitesh Kumar, Jeeva Kumar, Sachin Kumar, Narender.